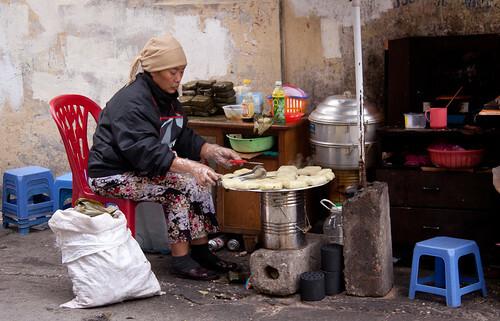 One of my favorite street chefs in the Old Quarter, Vietnam. Vietnam was our original choice for a touring holiday back in 2015, mainly to see Halong Bay, but we got sidetracked by the gorgeous pictures of Myanmar in the brochures and ended up going there instead. Myanmar, and probably touring holidays in general, was hard work, we are both in our sixties and do not really travel that well after having a lot of pampered holidays in the Maldives, so after the final three hour wait in another airport lounge we said ‘never again’. But three months later after sitting back and looking at the best set of holiday photo’s we have ever taken, we realised what wonderful people we had met and amazing places we had seen and that you have to put up with airport lounges, train stations and car journeys to get that. So the next thing we knew we were booking another touring holiday to Vietnam with Mango Journeys based in Cambodia! Warren the owner of Mango, actually an Aussie guy, sorted out our itinerary, click to view, we booked a couple of flights and it was done. Vietnam has a lot of Buddhist tradition like Myanmar so we figured that the people would be similar to the lovely people of Myanmar we met last year. Plus the landscape and scenery looked so green and lush so it all boded well. However when we arrived in Saigon, all the Vietnamese still call it Saigon, in mid December it turned out that it was still the rainy season. So it was quite cloudy, foggy and rainy…..and it stayed like that for most of the holiday actually. We hadn’t quite bargained for that, Myanmar was dry and sunny at the same time last year so this was quite a dramatic change. We were also in their winter so no crops were growing, hence all the lovely green and golden paddy fields you see in the brochures were mostly brown and muddy. Vietnam is big and very busy, there were a huge amount of Chinese tourists here, especially at Ankor Wat in Cambodia. A lot of the local people traditionally come home from all over the world at this time of year to see their families, so the place is buzzing. The Vietnamese people are also a lot more ‘tourist savvy’ here compared with the totally charming Burmese people we met last year, they seem to have that air of indifference you get in developed western countries towards tourists. It’s all sounding a bit disappointing and I’m afraid that is how it felt quite a lot of the time. We were in Saigon for 2 days….way too busy for us. Then a boat trip to the Mekong Delta, sounds idyllic but actually just a big busy river, we never really got far enough into the smaller tributaries where it might be more like you imagine the Mekong Delta to look like. A flight to Siem Reap then a couple of days around Ankor Wat. This was undoubtedly the highlight of the holiday. The Angkor Archaeological Park is mind boggingly massive! It took us 45 minutes by car to reach the pink sandstone temple of Banteay Srei in one corner of the park! The distances involved when moving between the various temples are all the same…..huge! Ankor Wat itself covers an enormous area but hugely impressive. It shows the power of this place when you get to the entrance at 5:00am to watch the sunrise and there are already hundreds of people there! And it happens every day of the year apparently. Although hordes of people can bug you sometimes, the collective enjoyment factor seems to override that here, the place is just so awe inspiring. We really enjoyed Cambodia, we wished we had spent more time there, we only met a few people but they all seemed to have more of that charm of the Burmese people. Cambodia has had an extremely troubled past, the war didn’t end until 1998 and everybody appears to have been tainted by it. Our guide lost 15 of his immediate relatives to it, and a lot of people seem to have similar horrific tales to tell. The landmine museum we visited was a poignant reminder of those days and our guide was obviously quite emotional in his rendering of the museum’s history and the people involved in it. As a result of the regime’s slaughter of all the ruling elite including politicians, teachers, scholars and intellectuals Cambodia was left backward in the rapidly growing economy of south east Asia. They are moving in the right direction now, albeit slowly, and we both felt we should have spent more time there and given them more of the benefit of our tourist dollar. Of all the other places we visited, Da Nang, Hoi An, Hue, Tam Coc, Mai Chau Valley, Hanoi and Halong Bay, Mai Chau Valley was like an oasis in a sea of traffic, busy people and tourists. When you look down at the valley from the main photo vantage point it has the look of the promised land, a lush green place nestling in the surrounding mountains. We had a couple of lovely walks around here over two days enjoying the beatiful landscape and meeting a few of the local people. We realised afterwards that we should have stayed away from the cities and done more of this sort of stuff. We stopped and spoke to a lovely 68 year old lady in Mau Chau vilage, there was nothing to her she looked so thin and frail. She told us, interpreted by our guide, that her husband left when she was 36 years old and because of the culture she was never allowed to be with another man after that. Her only daughter was married at around the same time and again the culture dictates that she moved to the husband’s village which was in south Vietnam. Her daughter is extremely poor and travel for local people is so expensive that it is extremely unlikely she will ever see her mother again. A small story but one that is probably played out a lot in this country. This amazing lady took us back to the one room brick built house with a small garden no bigger than your average shed that she now lives in. She managed to build it with help from the villagers who all seem to look after each other extremely well, so at least she now has somewhere dry to live. She was so welcoming though and showed us how she cooks, where she sleeps and the small garden she tends, it was without doubt the most touching moment of our holiday and one we will always remember. If you like busy cities then Hanoi is probably a better option than Saigon, it has an old quarter that is strangely quaint for a big city, is a lot more photogenic and a nicer place to be. We were never taken to new Hanoi so I guess it’s probably just like Saigon. Halong Bay was the main inspiration to visit Vietnam in the first place. I saw photo’s of this place back in 2014 when searching for more of the limestone karst scenery we had seen in Thailand’s Phang Nga Bay on a previous holiday. The boat trip with an overnight stay was the holiday finale and supposed to be one of the highlights. I mistakenly thought we would be touring around Halong Bay the whole time….a foolish assumption! We sailed for about 30 minutes, during which time we had a briefing and some food, then we dropped anchor and that was it! It turned out to be more of a booze cruise, with kayaking, happy hour, games, karaoke and Tai Chi in the morning! Oh my God, what a waste! This place is massive and to just sail into it for half an hour seemed ridiculous to us. I know a lot of it looks the same but as a photographer you are looking for those subtle differences in composition and quality of light that make great photographs. You can’t get that when you are sat in the same spot. I managed to get some reasonable photographs but overall, disappointing…..again! As I write this back in the UK, I’ve just finshed post processing our holiday photo’s after around four weeks work. Originally, because of the dull weather we had, I thought they were not going to be a patch on the photo’s from Myanmar last year, but I have been pleasantly surprised. I am constantly amazed at what you can pull out of seemingly dull photographs with the help of Lightroom, Topaz Labs and Photomatix for HDR. Back in the days of film I used to love the punchy colours you could get on a sunny day with the help of a polarizing filter and Kodachrome 25! Nowadays with the help of modern software it’s possible to get so much colour into photographs almost out of nowhere! I love making ‘impression’ type of pictures where the photo is transformed into a sort of painting….used judiciously they conjure up more of the feeling of a place than a straight photo. Those plus the power of HDR photography and Topaz Labs give our holiday snaps a warmth and colour that maybe isn’t true to life but always makes them look amazing! No wonder we got suckered into doing another touring holiday…..the photo’s just look so good! A word about Mango Journeys, they were amazing. All the guides were there to greet us and look after us wherever we went and they all seemed to enjoy their work, which always helps. Everything on the itenerary worked out OK…..in the end! We had one hiccup where we missed our flight from Cambodia back into Vietnam but Warren stepped in at 9:00pm at night and got us on another flight and into a hotel without too much bother and no extra charge. As it was our first visit to Vietnam Mango tried to give us a bit of everything I guess, stuff that most tourists want to see. In hindsight and learning from our Burma trip last year we should have really studied the itinerary and made sure it included what WE wanted to do, especially staying away from big cities! We are quite new to touring so it’s a learning process. Our next holiday? As soon as we got home we knew we ‘needed a holiday’ it had been so busy with a lot of travelling. We booked a week on Veligandu in the Maldives at Easter! Back to our favourite place in the world! Not only that we decided to put touring on hold for a while and booked two weeks on Filitheyo for Christmas. Back to just sunbathing, snorkelling, scuba diving and chilling! Heaven! We are UK’s leading Filter Specialists, selling online to the Plant, Agricultural, Commercial Vehicle and Marine Industries. PLEASE NOTE: I take Photographs purely as a hobby these days so am happy to share them with anyone who enjoys them or has a use for them. If you do use them an accreditation would be nice and if you benefit from them financially a donation to www.sightsavers.org would be really nice.